I've been carrying around this little Monterey Bay Aquarium Seafood Watch card for a few years now. It tells me which fish are okay to eat, whether they're overfished or full of mercury or other contaminants. Well, now it's available as an app for iPhone. Since I broke down a couple of months ago and got an iPhone (that's another story...), as soon as I found out, I downloaded that puppy. Got an iPhone? Get your free Seafood Watch app here, or at the iTunes store (did I mention it's free?). No iPhone? Seafood Watch recommendations are available for all mobile devices with an Internet connection. Visit mobile.seafoodwatch.org for their online pocket guides. No web phone? Do it the "old-fashioned" way, check out the website. Tired of hearing Samba, Fanfare, or Rondo Alla Turca when someone rings your cellie? How about giving endangered species a voice instead? The Center for Biological Diversity has over 90 ringtones ranging from peregrine falcon calls to beluga whale songs. And they just added 7 new ones, including the cry of an elephant seal pup. Over 200,000 Rare Earthtones have already been downloaded by thousands of people in more than 150 countries, including the UK, Canada, China, Japan, Iran, India, Poland, Germany, France, Brazil, Australia, and the US. 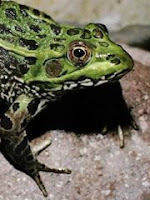 I'm going to download the Chiricahua leopard frog call right now. What will your endangered animal call be?